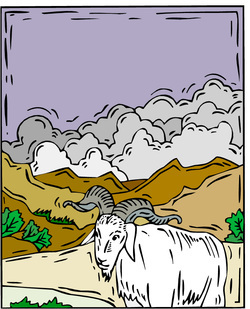 The Scapegoat: Good for What Ails You! The group of middle schoolers were curious as I started into the first time I had ever taught on the sacrifices the priest brought to the tabernacle on the Day of Atonement. In addition to the bull, he brought two goats. (Leviticus 16) The one was for a sin offering: blood on the mercy seat; atonement made. The other was the scapegoat. I always had wondered why there were two goats. The goat that was killed represented that payment was made for sin. Wasn’t it redundant to have all the sins of the people confessed onto the head of the live goat just before it was led out into the wilderness? We "reinacted" what that would look like. I put my hands on one boy's head and "confessed" the sins of our little group. I asked my students, "If you were there watching this goat going into the wilderness, what message would you get? Your sins are taken….AWAY!" So I asked them why there were two goats. One girl’s eyes lit up and I could tell she had come to the same conclusion I had. Both sacrifices are a picture of Jesus--and Jesus both died and came to life again. His life continues to be sufficient to carry away all of our sins now. The goat that was killed was a one-time payment. It showed what sin cost. The live goat was a reminder of what had happened and continued to happen. After the lesson it was time for the assignment: that night the students were to imagine themselves putting their hands on the Lamb of God. First they had to tell Him all the things they were guilty of....those things that they should have done and didn't do, or they shouldn't have done and they did do. THEN I told them to also confess their shame. Those are the things about us to which we are much more connected that we don't want others to find out about us. It doesn't even have to be a 'wrong' thing in order to feel ashamed about something. The natural urge in dealing with shame is to hide it rather than expose it for what it is. So...after putting both guilt and shame onto the head of the goat, what happens to it? It is taken...AWAY.